Especially made for cooking syrups and boiling sugars. Confectionary requires a fair bit of science to support its art. Temperature must be diligently controlled and maintained during the process. 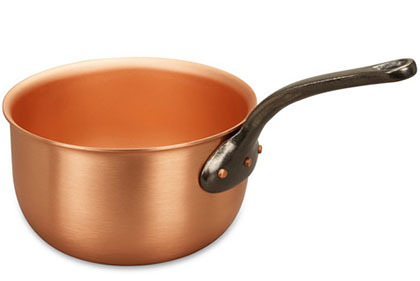 Our 18cm solid copper sugar pan will control temperatures for perfect performance every time. As sugar breaks down, its components have the ability to block reactive copper ions. That's why unlined copper is used when making sweets and sugar syrups. Falk Culinair's unlined 18cm sugar pan is unsurpassed in its ability to maintain the crucial temperature variables of the confectionery process.